One of the requirements in the Faith In God book under the Learning And Living The Gospel Category is to "Prepare a pedigree chart with your name and your parents' and grandparents' names. 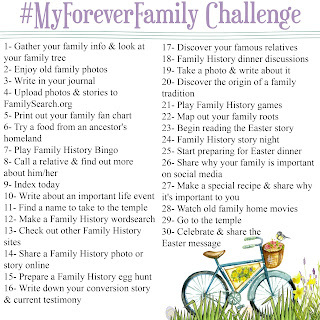 Prepare a family group record for your family and share a family story. Discuss how performing temple work blesses families." Family Home Evening on Learning about your heritage and doing family history work. There is so much to do with this that I am planning on doing it for a couple weeks. This is week one. Start out small, give each family member the a copy of "My Family Booklet". You can download a copy here. (It is found on the right hand side where it says, "download a copy here." Have pictures printed out a head of time of each family member. Have each family member paste their picture of themselves on the page labeled "About Me". Then help each family member answer the questions in this section. Continue pasting the appropriate pictures and answering the questions on each page. You can go as far as your family would like. You could also complete some on another day. It might be fun on the grandparent part for the kids to interview their grandparents and find out more about them. 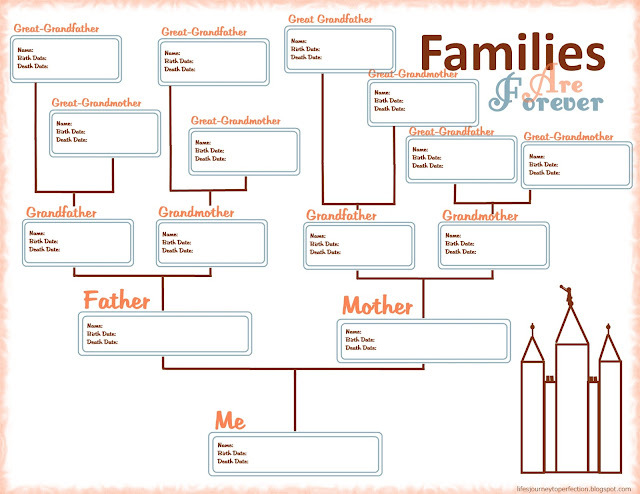 Fill out the Family Pedigree Chart. There is one in the booklet or you are welcome to use this one. Prepare a Family Group Record. You can use this form found here. Discuss the blessings that come from performing temple work.